By law, we’re only permitted to sell you 2 of this item . Please read right through the information on the outside and inside of this pack before you start using this medicine. If you have any questions, or if there is anything you do not understand, ask your pharmacist. Adults (including the elderly) and children aged 16 years and over: Swallow 1-2 tablets every 4 to 6 hours as needed. Do not take more than 8 tablets in 24 hours. Children aged 10-15 years: Give 1 tablet every 4 to 6 hours as needed. Do not give more than 4 tablets in 24 hours. Do not give for more than 3 days at a time. Do not give to children under 10 years. TAKE SPECIAL CARE Contains paracetamol. 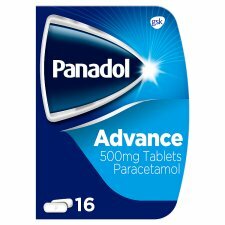 Do not take with any other paracetamol-containing products. Ask your doctor before you take this medicine: If you have liver or kidney disease, including alcoholic liver disease If you have mild arthritis and need to take painkillers every day. WARNINGS Do not exceed the stated dose. Immediate medical advice should be sought in the event of an overdose, even if you feel well, because of the risk of delayed, serious liver damage. If your symptoms persist consult your doctor. Keep out of the reach and sight of children.